The most successful run of the comic to that date, 1965 saw Stan and Jack use their imaginations once more by creating brand new characters that would become cornerstones of the FF mythos: The Frightful Four and the Inhumans. Even old favourites like Doctor Doom are reinvigorated and given a fresh spin, while the most significant element is the shift away from single-issue stories. Not just in terms of multi-issue arcs (The evil FF get a trilogy, while a five-part introduction to the Inhumans carries over into 1966) but in the way plot elements are allowed to pass from issue to issue. Most surprising this time is in #38, where the increasing powers of the FF see Sue's force field now able to withstand an atomic explosion, but the resultant radiation removing their powers in a touch of cold war angst. While having super heroes lose their powers became a fairly common trope in comics (and would be used again in the FF, many times), it was relatively novel here. What was even more significant was that with other characters, such as Spider-Man and the Hulk, it was the result of nuclear experiments that they obtained their powers... here that works in reverse. (The first "super hero loses his powers" story produced by Marvel was in the very first Amazing Spider-Man annual, a tale which also featured a dozen panels of the Fantastic Four). Of the issues themselves, then #36 introduces probably the corniest and most obvious idea to the series: the evil FF. It had already been toyed with, from Doctor Doom's three super-powered henchmen in #26 to the Red Ghost's super apes. Yet here we have the frighteningly silly Frightful Four. One thing that should be noted is that despite revolutionising the comics industry, even upon its inception the cultural signifiers of The Fantastic Four made it old hat. So while the melodramatic titling of enemies as "Doctor Doom" and "Mole Man" may have just about passed in 1962, when they continued into the end of the 20th century they became almost anachronistic. Without the chic status of The X-Men or the passable, neurotic goofiness of Spider-Man, I believe this is what began to dent the sales figures in the late 90s, almost as much as the declining quality of the book. All of which rambling points us towards the exceptionally fey name of their new nemeses: The Frightful Four. Such a twee, old-fashioned description of mild villainy, not dissimilar to The Cheeky Twosome or The Naughty Nine. Thankfully even Stan realised that "Paste Pot Pete" was pushing it, and quickly renamed him The Trapster for their rubber match two issues after their debut. Yet despite their premise being utterly ridiculous and their bright purple costumes looking garishly camp the group are still effortlessly engaging. Roy Thomas repainted them as underachieving light entertainers (albeit very wittily) and they were virtually ignored by John Byrne, while they'd become completely outmoded in the 90s. But here they're surprisingly effective and sinister, appearing five times throughout the year. One curious thing is that only half the group actually have superpowers, with The Wingless Wizard and The Trapster being technologically gifted mortals, and, despite the assertion of various characters that she has immense power, having living ginger hair doesn't really add up to a whole lot for Madam Medusa. So it is that The Sandman is the only truly superpowered member of the quartet, his early alpha male bashing of the Trapster a far cry from the conscience and rejection of villainy Marvel gave him in the 90s. Yet while the title insists that they're a major threat (including Madam Medusa splashing tap water over Johnny with her hair to put his flame out) even their most super-powered member can't compete with the Fantastic Four in their original appearances. Issue #41 has the Sandman decide to murder Ben, and crack him on the head with a rock-hard punch... only to hurt his own fist and cause himself pain as a result. Still not quite the blue collar character he became, the early Sandman is prone to retrospectively out-of-character lines like "what a fool I am! ", up there with the Thing's "bah!" in the first few issues. 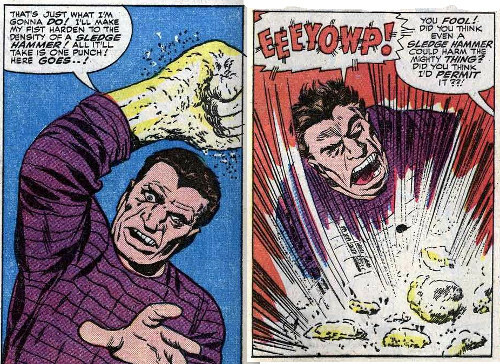 Come 1966 (issue #57) and the situation has been altered, with the Sandman able to hurt Ben with a punch for the very first time, while 1967 (issue #61) increases this upscale of his powers by having him able to take on the entire FF single-handedly, and 1969 sees him cross over to the Hulk's own title to take him on. 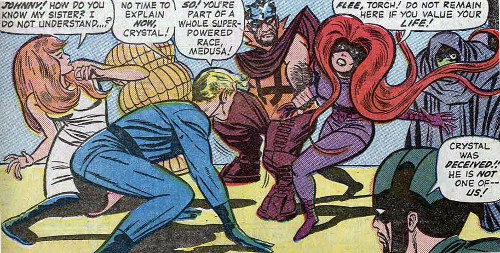 Another curious element of the group is that only Madam Medusa saw her debut in the comic itself. 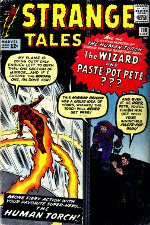 Paste Pot Pete and The Wizard were incumbents from Marvel's Strange Tales title, with three and five appearances respectively. The Sandman, meanwhile, was a Spider-Man foe who had had five prior appearances in Marvel comics before this adventure. After this he wouldn't cross paths with Spider-Man again until 1972, having successfully crossed over as a FF villain. Their first few meetings with the Fantastic Four sees them frequently victorious, including a return match where the FF narrowly escape destruction and, as stated, lose their powers. This sees a curious bit of "alternate history" by Stan, as the weapon, a fictional Q Bomb, was left there after underground nuclear testing by a "powerful Asiatic power" - clearly intended to be China, who had conducted their first nuclear test on the 16th October 1964. However, it wouldn't be until 1969 that the country had an underground nuclear test. The final trilogy sees the evil FF narrowly beaten, with Madam Medusa escaping (and an update on the Trapster and Sandman in jail during issue #45), The continuing plot strands eventually open out to reveal Madam Medusa's origin as one of the Inhumans, and it's extraordinary in retrospect how hostile relations between the FF and The Inhumans initially were. Add to this one of the very best Doom stories and this might not be the deepest run of The Fantastic Four, but it's one of the most entertaining. Yet sadly it wasn't all this good, with #34, "A House Divided!" possibly the worst FF book Stan and Jack ever did, a childishly plotted and motivated story that sees a Gregory Gideon arrange to buy out business tycoons if he can defeat the FF. What's worse, the silly bugger pays a million dollars for someone to devise a plan to defeat the FF - a plan which involves nothing more sophisticated than things like writing Johnny's a Doctor Doom robot on a wall and leaving it for Sue to find. The Machiavellian genius of it all! In terms of trivia then not only does Gideon own the local electricity company, but he's also the owner of the Baxter Building. The character was brought back exactly 100 issues later by Gerry Conway, when the saccharine ending - Gideon gives up his entire fortune for the love of his family - saw Gideon's wife die, and him have a nervous breakdown as a result. Despite such a ridiculous premise and some of Stan's worst writing, the issue does, however, contain some fun references to popular culture of the time, with Ben telling Johnny (who is, typical of the period, verbalising a physical danger that's befalling them) that he's becoming "a regular Huntley and Brinkley". Although the CBS news programme The Huntley-Brinkley Report had been running for eight years, it really reached its peak during the 60s, and by 1965 was the highest-grossing programme on US television. Entertaining a younger audience is the unforgettable sight of the Yancy Street Gang sending Ben a Beatle wig, which he tries on. The Beatles album of the period was the US version of Beatles For Sale, titled Beatles '65. It hit the number one spot a week after the cover date of "A House Divided!" and remained there for nine weeks. This attempt to cash in on the Zeitgeist saw Stan change the company title to Marvel Pop Art Productions from September 1965, a decision that was hugely unpopular with the fanbase and was reversed after just four months, with Stan offering an apology in the January 1966 issues. But the appeal of Marvel Comics in college dorms was beginning to grow, so much so that #35, "Calamity on the Campus!" saw the group visit a university. While the same issue features the creation of the android Dragon Man and the return of Diablo, it's mainly centred around the fun interactions of the group around the campus, including the high school age Johnny (revealed as just 16 in a 1964 letters page) being ignored by all the students who see him just as a kid. Some more of Johnny's 60s bigotry leaks out, as he goads Diablo with a vaguely homophobic slur, telling him that his brother "wears knickers". Stan was vocal about his disinterest in the Diablo character, and although he'd never write another story with him in it, Roy Thomas did resurrect him in 1967 for two issues of The Avengers, and other writers brought him back into the Fantastic Four title after Stan had left. 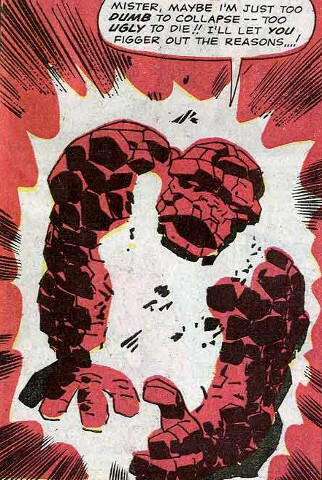 The same issue also gives us the trivia of Johnny being able to absorb fire, and the Thing's weight - it's 500lbs. It ends with Reed and Sue finally putting aside their romantic complications and agreeing to get married, something that takes place in the third annual. Although superheroes getting married was relatively novel, it was pre-dated by the December 1964 DC comic "The Wife of Aquaman". When Reed finally gets confirmation from Sue that she loves only him, it does see a real change in the character, as the doubts that sometimes wore him down are removed, and he becomes more demanding and dismissive, almost arrogant. It's quite a striking characterisation that the leader of the group is far from the most likeable or relatable, and while issues of the 21st century that depict Reed as socially inept seem to take it too far, this was part of the original characterisation, something often forgotten when the inks of Joe Sinnott transform him into an alpha male. His over-protective attitude towards Sue (that eventually sees her leave the team) starts here, with burgeoning displays of sexism that are almost quaintly hilarious taken out of their era. As the three images above show, sexism wasn't solely Reed's department, as the female cast members were more than capable of thinking sexist things about themselves, thanks to Stan's values. which seem antiquated today, but were not so extraordinary at the time. The wedding of Reed and Sue takes place in the third annual, where Doctor Doom uses his "emotion charger" to get every villain for miles to attack the team. It's a light-hearted and, sadly, throwaway issue, where a rather childish "battle royale" takes over any connection between the team, though it's one hard to hate. Notable is that Reed, despite having a suit ready, eventually gets married in his Fantastic Four costume. Although the 2007 Rise of the Silver Surfer movie had its two wedding attempts told with a more realistic suit and tie, it was the unreleased 1994 movie that had a depiction of Reed's wedding outfit that was true to the comic. Completing the annual are two reprints, supposedly the two most-requested issues, which include Doctor Doom teaming up with the Sub-Mariner. As the other issue is #11, the wonderfully offbeat Impossible Man tale, it perhaps put paid to suggestions that readers didn't like the Impossible Man's more outlandish story when it first appeared. Sue's darker urges, explored further in the 1980s, first sees its seeds here, with her initiating a revenge mission against the Skrulls for killing her father. Issue #37, "Behold A Distant Star", sees the group use warp technology to pass through subspace and attack the home planet of the Skrulls. Although quite a likeable issue, it does conclude with a well-meaning but over-earnest "moral of the story" of which Stan was often fond: "Perhaps we're not really so different from others -- either on Earth -- or in the endless void of space! And, the day all of mankind realises that lesson -- we shall come a step closer to brotherhood -- and universal peace!" It's a nice tonal shift away from the initial right-wing underpinnings of the book, but a little too trite and on the nose to really pay off. Probably the story which most informed the characters for years to come was the classic "Battle of the Baxter Building", which both demonstrated how dispassionate Reed can be, and, more crucially, Ben's will to never quit. Facing Doctor Doom without powers, Reed uses a gadget to transform Ben back into the Thing against his will. What then follows is one of the most thrilling Doctor Doom battles of all time, as he hurls offence after offence at Ben, including unstoppable gravity waves and energy bolts. Through sheer force of will, Ben comes through it all, eventually crushing Doom's hands and leaving the FF in disgust after Reed had turned him back into the Thing. While this is a wonderful display of Ben's spirit, it did sadly come to define the character for many decades to come, whereby "rising against the odds" became his stock-in-trade, and today comic book forums will have many posters declaring that he'd lose all number of fantasy fight match ups, as "getting beat down" is "what he's known for". It's a classic example of how authors will repeat a characterisation to ever decreasing returns, taking away what made that characteristic so special to begin with, to the detriment of said characters. Probably the most controversial element of the run was the change of inkers. Chic Stone left after Issue #38, with Frank Giacoia (under the name "Frank Ray") filling in for Issue #39. One of Marvel's most prolific inkers, his association with the Fantastic Four title was brief, only inking eight issues between 1965-1979. But for a four-issue run, the team was inked by Vince Colletta. An Italian inker who had a six-year run with Jack Kirby on Journey Into Mystery (later retitled The Mighty Thor), Colletta had a reputation for rushing inks due to time constraints, and had many vocal critics in the industry, including Joe Sinnott, Steve Ditko and Gene Colan. Colletta would defend his actions - which included erasing details if the deadlines wouldn't allow their completion - by stating that in the era he worked, the printing presses would charge if the issues weren't delivered on time, and that he was saving the company money. It's a situation with both sides of an argument, but for his work on the Fantastic Four then, while the annual was a little scrappy, his inks on the main title produced some strong results. The Frightful Four trilogy (the first three-part story in the book's history) shows signs of cutting corners, but rushing of inks wasn't something Colletta did each time, and, as the image of the Thing above attests, when he had time, he could produce some stunning work. From issue #44 onwards, Joe Sinnott took over the inks, working on 213 issues until 1981. Sinnott's slicker, more vibrant inks would see the title reach its full potential the following year. Notes of trivia for this run include the fact that when Walt Simonson came to reinvigorate Doctor Doom some 26 years later he implied that most, or all, of Doom's clashes with the FF after the climatic "Battle of the Baxter Building" were with robot doubles. (#350) The same issue also has Doom not recognise Ben Grimm, with Stan stating that he'd never met him before... despite the second annual showing them together. Also of note is a curious double goof in #36 where the Thing asks of Professor X "Who's the billiard-ball-head over there, baby?" - despite having been introduced to him only the previous issue! The reason for a double goof? The person he's asking is the blind Alicia. In terms of the powers of the group, then there's generally a slight shift towards making Sue and Johnny more powerful, with Johnny getting to create a vaccum spout that carry along the rest of the group, and Sue beginning to use her force field for offence. Look out for a couple of somewhat crass attempts to plug Marvel's new title "Monsters to Laugh With", a series that had photos of old horror movies, where Stan would add mocking captions. Running for just seven issues, the title wasn't a success, despite the attempts to crowbar its existence into the FF. And look out for another obvious attempt from Stan to censor Jack's more risque illustrations with Issue #38... Ben clearly puts Sue over his knee and raises his hand to playfully spank her backside, but the dialogue suggests anything but. Also in the same issue, Sue's hair changes from the pale yellow it had been for the past several issues back into the full blonde we know her for. Talking of Sue's hair, look out for #36, where she apparently has an off-panel haircut halfway through the book. Finally, one of the Thing's most enduring catchphrases, "What a revoltin' development!" makes its first appearance on the final page of Issue #35. Writing this site from the other side of the Atlantic, I'd assumed that the endearing phrase was an original, yet the truth was it was a very famous catchphrase from the radio and television series The Life of Riley, the star of which, William Bendix, had passed away in December 1964. While the cover date of the issue was listed as February 1965, hence its inclusion here, the actual publish date and certainly the writing/illustrating date would have been some weeks earlier. That this continues the FF's jinx of containing references to real life people is a minor backdrop to the fact that it brought Bendix's catchphrase to a whole new generation. While not a necessity in order to understand the run of FF issues presented here, seeking out the various origins of the Frightful Four members might prove enlightening reading. Strange Tales was the name of an anthology series published by Atlas Comics from 1951 up until May 1969, by which time Atlas had long changed its company name ot Marvel. Originally beginning as a horror series, The Human Torch was the first superhero to get his own 13 page mini-strips as the main feature with issue #101. The Wizard's debut was in #102 (**), while #110 (***) saw him meet Paste-Pot Pete for the very first time and #118 (***) is perhaps the most important of these related issues as it leads directly into his plight in FF #36. Paste Pot Pete made his debut in #104 (****), while #124 (***) showed off his new look and his fear of The Thing. As for the Sandman, as stated his initial Marvel appearances were Spider-Man related. His debut was in Amazing Spider-Man #4 (***), though for his second appearance he did cross over to menace the Torch in Strange Tales #115 (***). Pre-evil FF he returned with Spider-Man in Annual #1 (****) and #18 (****) actually featuring cameos by the FF. Finally, the last pre-FF #36 edition for Sandy was The Amazing Spider-Man #19 (****), which included a high-profile guest role for the Torch and the prophetic line from Johnny "Count your blessings, mister! What if you had my three partners, also?" A brief overview of every Human Torch Strange Tales story can be found under the "Other Titles" section, including more details on the appearances of the Frightful Four.